Please click on this line to visit our Concerts page for further details of our regular shows which use this magnificent instrument. 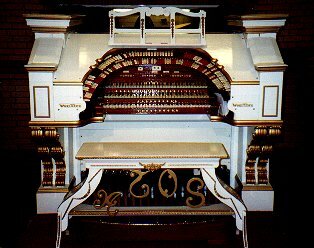 Our Chapter owns the 3 manual 19 rank Woking Wurlitzer. It continues to be our main priority and is kept in tiptop condition for our monthly presentations to members and public alike. This instrument has also proven to be a major attraction at the annual CAMRA Beer Festival, an all-ticket sell-out affair attended by several thousand. The instrument was originally installed in the Granada Welling in South East London which opened on the 22nd November 1937. It was Opus 2220 and with its original three manual eight rank specification it was one of six installed in theatres in the London area. They were considered as standing head and shoulders above all other organs installed in neighbouring theatres. Sadly all but one of these instruments have been removed from the theatres and reinstalled in other venues. The only organ remaining in situ is in the Granada Harrow but this is now unusable. 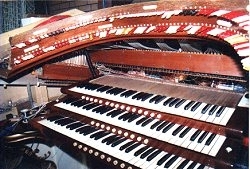 When The Granada at Welling closed the organ was purchased by the London and South of England Chapter and was removed by the technical team under the leadership of Mr Les Rawle. The organ was stored for a number of years before the technical team, with new recruits from the local area, installed it in what was called "The Projectile Hall" at Woking Leisure Centre. Three chambers were built at one end of the hall, the centre one being of half height, so that a storage space for the console was formed under the floor. 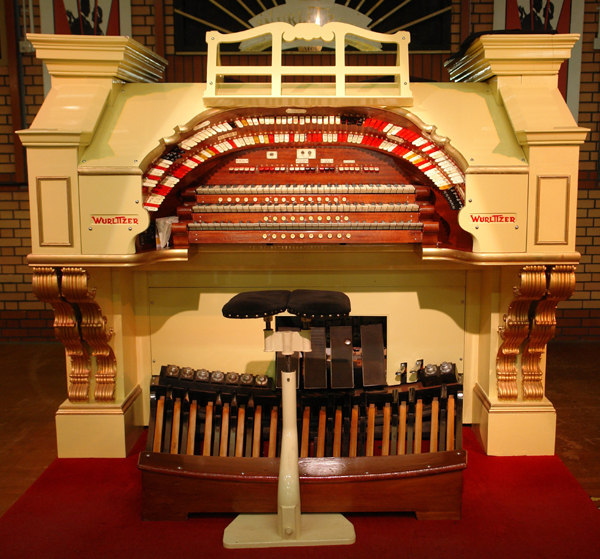 The centre chamber, which is shuttered, houses the Traps, Glockenspiel and Xylophone, and it also accommodated the Wurlitzer relays. The pipe chambers either side are at floor level with a glass window in each so that the pipes can be seen by the public attending the concerts. The opening concert in the Woking Leisure Centre took place in August 1995. 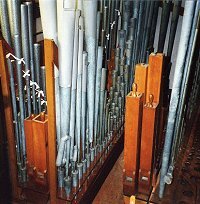 Between then and the summer of 1998 an extra chest was installed in each chamber in order that the ranks of pipes could be increased to 17. These extra ranks of pipes were slowly added and indeed some were connected up to play using the surplus piano stops already in existence on the then single stop rail. By the beginning of 1998 the console had been altered to make space for the second stop rail which was still under construction. 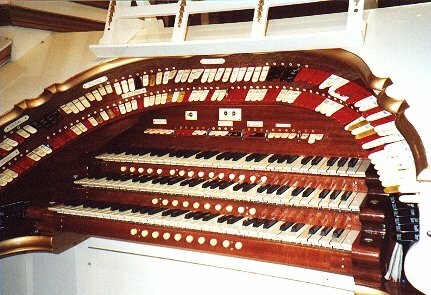 Since the size of the organ was to be doubled this would mean an extra set of Wurlitzer relays would have to be found to control the extra ranks. While this might have been possible, the problem of where to site them remained, as very little space was available in the small centre chamber where the existing relays were housed. 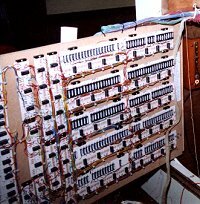 At this point it was decided to install for the whole organ an electronic relay system designed and produced by Bill Walker, and at the same time to add an electronic piston setter with 64 memories. The electronic relay is simply a digital multiplex system and is not a computer, therefore eliminating the problems of system crashes suffered by some microprocessor driven organs. 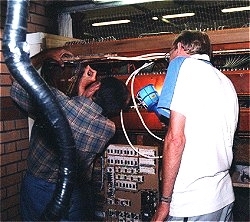 Two weeks before the Tea Dance on the 27th August 1998 the Technical team, under the leadership of Les and Len Rawle, started work. The idea was to carry out all the work that could be done while still keeping the organ in a playable condition for the Tea Dance. This involved installing the electronics in the centre chamber and starting to wire up the extra ranks wire by wire to the electronic boards now screwed to the walls. At the same time, some members of the team were completing the building and wiring up of the second stop rail ready for installation later. Immediately after the Tea Dance the organ console was stripped down and pushed into it’s storage area ready for an early start the next morning. Work now started apace, since the plan was to have the second stop rail, the electronic relay system and the piston setter all installed, wired up and running for the next tea dance in September, a mere four weeks away! Members of the technical team worked on the organ diligently every day, and on the Monday before the Tea Dance was to take place, Len was able to test and play the individual ranks as the multiplex system was connected up rank by rank. Very few problems were encountered at this stage, which was a testament to the quality of the soldering of the many thousands of joints which had been made in the past six weeks. Any faults were cleared on the Tuesday and the organ, all 16 ranks of it was tuned by Les on the Wednesday. The newly enlarged organ was first heard at the Tea Dance the very next day where it performed faultlessly. Having an electronic relay system (pictured right) means that the electronics in the organ are connected to the electronics in the organ chambers by a cable containing 36 wires, of which only 28 are actually used. The original cable containing hundreds of wires which it replaces, can be seen in the above picture. It also means that things like Sustain and Pizzicato are easily achieved. The addition of a Midi module and Midi stops on all manuals including the pedals give the ability to plug in and play any midi capable instrument, like an electronic piano, from anywhere on the console. In early 2003 a Quintadena rank was added, and then in 2004 a Clarinet and Kinura were added making a total of 19 ranks in all. 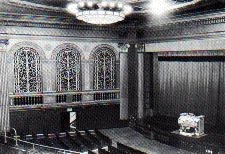 The Wurlitzer attracts more people into the hall, now renamed "Wurlitzer Hall", than any other activity, thus with regular well supported concerts each year the future of the organ is assured.